Last Sunday was Mother’s Day in America (two months later than England). We were over in Santa Rosa, and we all had doughnuts on Sunday morning (or ‘donuts’ as they insist on spelling them over here), after which my son and I watched the Formula One, for it was the Spanish Grand Prix, which was won by Spanish driver Fernando Alonso. 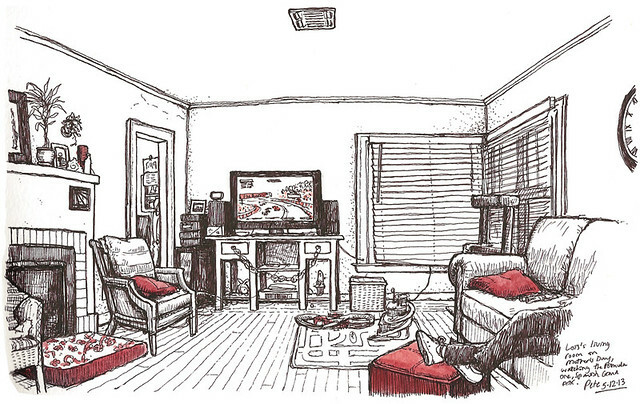 I sketched the living room in my Moleskine, while family milled about. Sketched with brown uni-ball signo um-151, with a spot of red paint. Hope you mothers all had a happy mother’s day! I watched that race with my son, too! I was a big F1 fan for a few years, and I’ve always preferred F1 and road courses to Indy cars and oval tracks. Indy cars roar, F1 cars scream!